Mr. Lang's "Commencement" speech wasn't well-covered by the MSM. You are of course referring to... Lana Lang's father? I see what might be a loop, but I'm so far outside of it, it looks like a dot. I've been surfing for 20 minutes, & nothing comes up for an unemployed "Lang" who isn't fictional (& long dead) except Brian Lang (idjit Interwebs sports handicapper). After all that surfing, I've concluded that this cartoon is simply about a paradigm shift in how job searches have changed since Al Gore's invention caught on--& the name "Lang" is coincidental. I hate having to work so hard to understand a subtle joke. 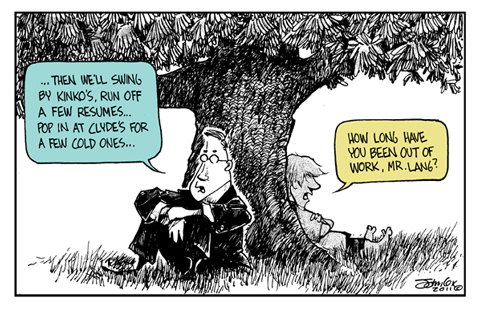 An equally valid question would have been, "How long has it been since you had to look for a job, Mr. Lang?" --as I find many older, formerly entrenched executives to be out of the loop (in more ways than one) & highly technically challenged. They remind me of the scene in The Shawshank Redemption where Brooks Hatlen was paroled as a senior citizen after spending his entire adult life in prison, & he can't cope with how much the outside world has changed. So--this is John's take on how a PHB deals with the world when he's forced to leave his insular office/cocoon. Am I right, or did I miss something? The surname "Lang" is short and very random. The toon is a mere comment on one boy's summer break is another's endless search for meaning. Get busy living or get busy dying. Easy peasy japanesey. Wow, deep perspectives on life, John. Good explanation. Also, he makes paper resumes at Kinko's... last time he worked was surely back in another era! "another's endless search for meaning"
wow... deep stuff... so subtle I completely missed it. PAPER!! That's a big clue for guessing my last foray into employee-hood. ...but I feel a little bit of relief that I was on track with the Kinkos/paper resume thing. ...but now that JOHN has explained it, I like it. Amazing the perspective one gets when you alter the point of view. Thank you for your article, I feel that my life and find you how. Your blog is like a mirror.. This page contains a single entry from the blog posted on June 5, 2011 5:20 PM.